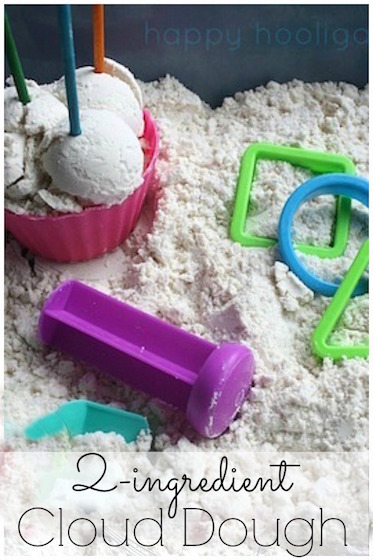 Learn how to make Oobleck for sensory play and science activities with this quick 2-ingredient recipe! I’ve you’ve ever read Bartholemew and the Oobleck by Dr. Suess, then you’re familiar with this fascinating substance. If you haven’t, let me enlighten you. Oobleck is a non-newtonian fluid that changes to from liquid to a solid and back again when handled. When you squeeze Oobleck or exert any pressure on it, seizes up, the substance becomes hard and crumbly mass. When you release the pressure, it morphs into an ooey, gooey, goopy liquid. It’s mesmerizing to play with. Other examples of non-newtonian fluids are flubber, quicksand and silly putty. 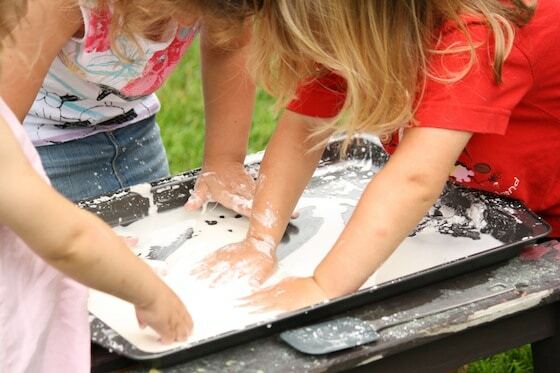 Oobleck is also known as Goop in the preschool world and sometimes referred to as magic mud and ooze. We’re no strangers to simple scientific concoctions here in my home daycare. 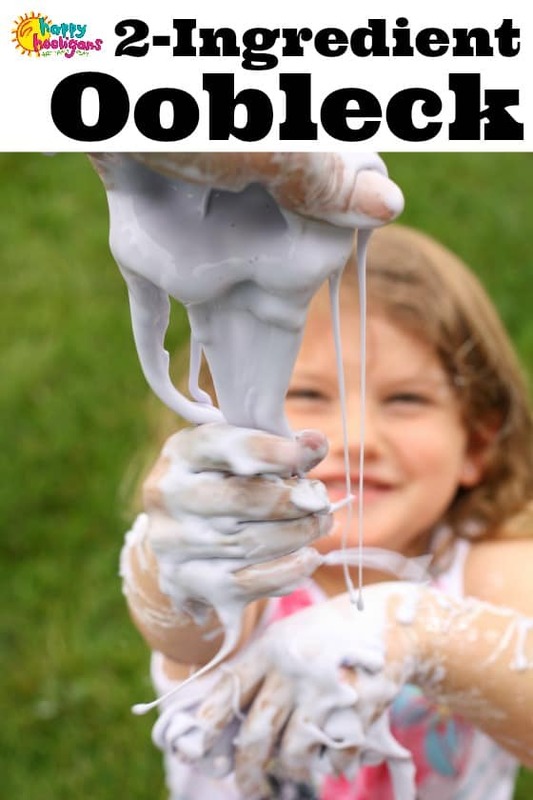 We love clean mud and cloud dough, and Elmer’s glue slime, but because of it’s fascinating scientific properties, Oobleck is the most amazing sensory substance of them all! If you’ve never made Oobleck before, you must! 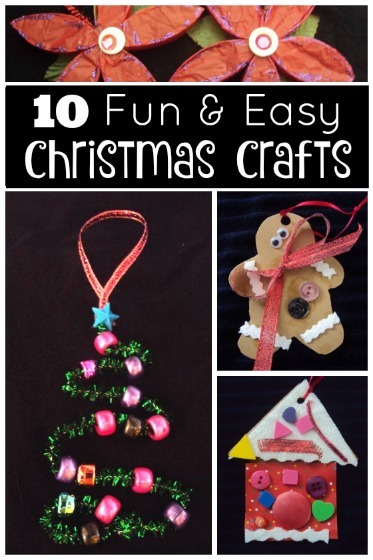 It’s so easy and it will keep your kids entertained for ages. Making Oobleck couldn’t be easier. 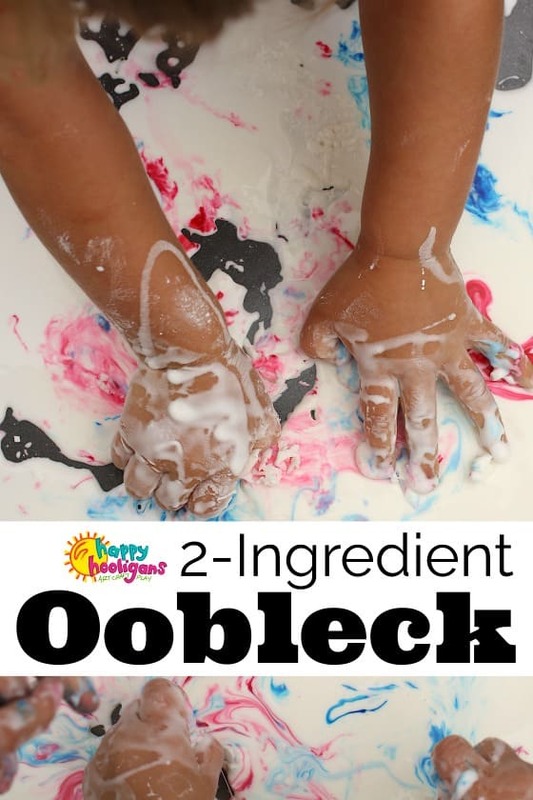 The basic Oobleck recipe is just two ingredients: water and cornstarch! If you’ve ever combined these two ingredients while cooking, you’ve seen oobleck in action. Resting in a bowl, a cornstarch and water mixture looks like liquid, but if you put some pressure on it with a spoon, it can firm up so much you can hardly stir it. 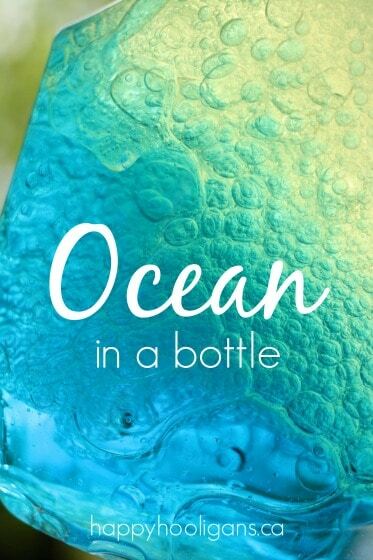 Just imagine how wonderful it feels to when a child sinks his or her hands into it. It’s pretty awesome. You should’ve hear the hooligans shrieking and squealing when they play with it. This particular batch of homemade Oobleck held the kids’ attention for over an hour. That’s a successful round of sensory play if you ask me! Let the kids mix it by hand! I started by dumping a generous amount of cornstarch onto a baking sheet. I didn’t measure but it was probably a cup and a half. 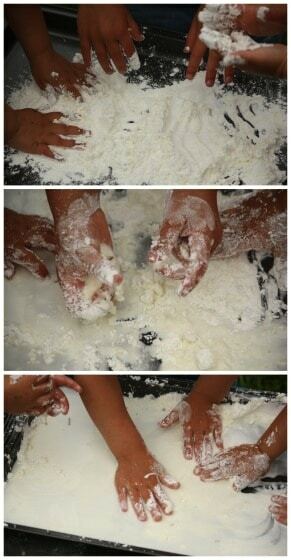 I gave the hooligans a minute to explore the cornstarch with their hands before adding any water. The fine powder feels so silky and soft. Then I poured about a cup of water onto the tray, and I had the kids mix it together with the cornstarch with their hands. As they were mixing, I added more cornstarch until it reached the consistency I was looking for. You’ll know the consistency is right when you get there. Your Oobleck will become solid when you squeeze it or push it around on the tray, and it will transform back into an oozing liquid when you release it. 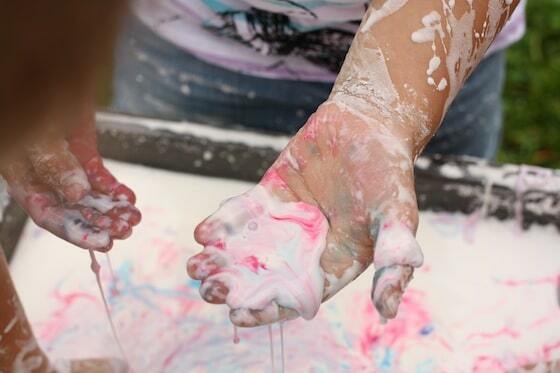 We played with the all-white Oobleck for a while, and then, for fun, we added some colour to the mixture. 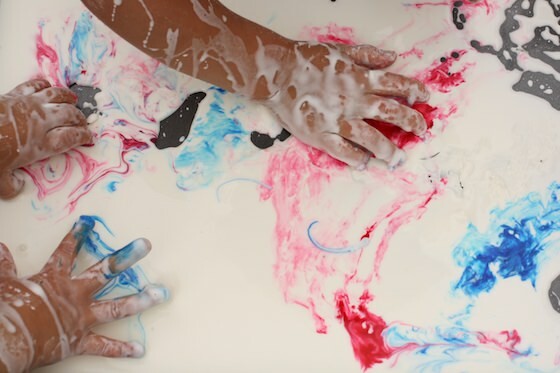 I sprinkled about a half-dozen drops each of red and blue Liquid Watercolors on to the surface of the goop, and the hooligans got to work mixing it in to the concoction. This took a while because of how resistant the cornstarch and water mixture is to pressure. We really had to work hard to blend the colour with the goop. It was great exercise for those little fingers and hands and a wonderful way to observe the two colours mixing to make another colour. They were excited to see their Oobleck gradually turning purple. 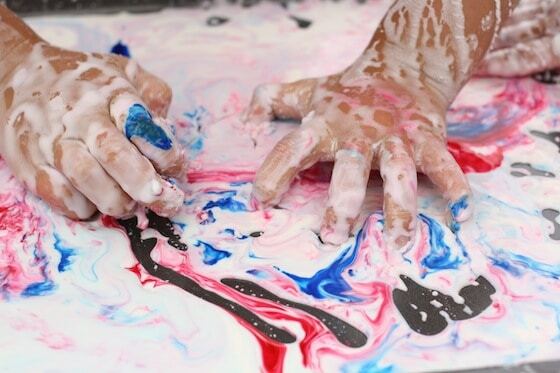 You can also add toys to your Oobleck, or add flowers and leaves to make our Nature Goop. Squeeze it together, and you get a solid lump. Let it go and it slithers away between your fingers. The girls loved it when I held a big handful of Oobleck up high and let it drizzle down over their hands. They’d grab for the goopy strands and watch as their own grasp would turn them back into solid form again. What a wonderful, hands-on way to explore the properties of cornstarch and water! Oobleck is easy to clean up! Cleaning up our Oobleck was a breeze! It washed away in seconds with a spray from the garden hose! Goop outside is brilliant!!! This looks soooo fun :). My kids love that too ! We call it slime, What’s the difference between Goop and slime ? (I don’t make slime with Borax, not easy to find in France). Thanks for all your wonderful ideas ! I teach art to kindergarten through 5th graders and have been following your posts for about a year. I just have to say that I bet your hooligans are more than fit to be ready for school when it’s time to go, and that I’m sure they miss you dearly when they do. Thanks for taking the time to share your work – err – fun! My kids love this stuff! I’m from New York and we call it oobleck, based on the Dr Suess book “Bartholomew and the Oobleck”. 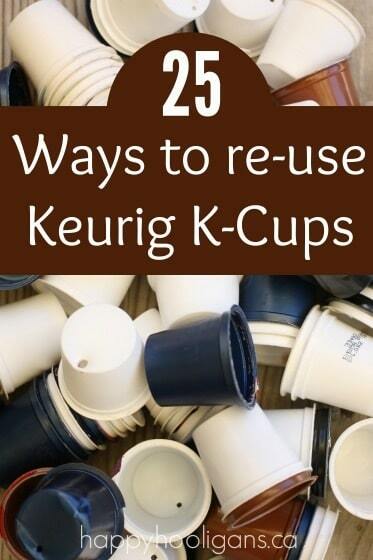 So easy to make and so easy to clean up! Thanks for all the great ideas! This is the greatest stuff. Kids of all ages love playing with this. How long will the gloop keep for in a container? I’ve never tried keeping it, Tanya. I would imagine it would keep for a day or two, but I’m just guessing. Ooblek is a favorite at our house, too! It holds everybody’s attention, even my 11 year old’s. Pro tip: ooblek is easiest to clean up indoors if you let it dry first. Then you can scrape it loose and sweep or vacuum it up. That is some personal experience knowledge.